Hey, Opie — in New York, the newspapers think it’s the 1950s. Let’s put our pop in a sack and ride the Chevy to the levee and gaze at the stars. The NY State Press Association is distributing six ads in its campaign to resurrect the fortunes of its member newspapers. MAYBE these ads — all attractively composed by Korey Kay & Partners — will click in rural Upstate, but they won’t wash in ANY urban area, especially New York City. As I reported last week, this is a well-meaning effort by a well-meaning organization. Too bad it doesn’t work. This trooper’s not NYPD, the highway is pure rural (maybe even desert-like), the car’s nothing like the Minis, minivans and SUVs that populate the urban landscape. And we all know how youngsters in Brooklyn and the Bronx pine for the coming of the carnival in that big lot at the far end of town. Holy cow! 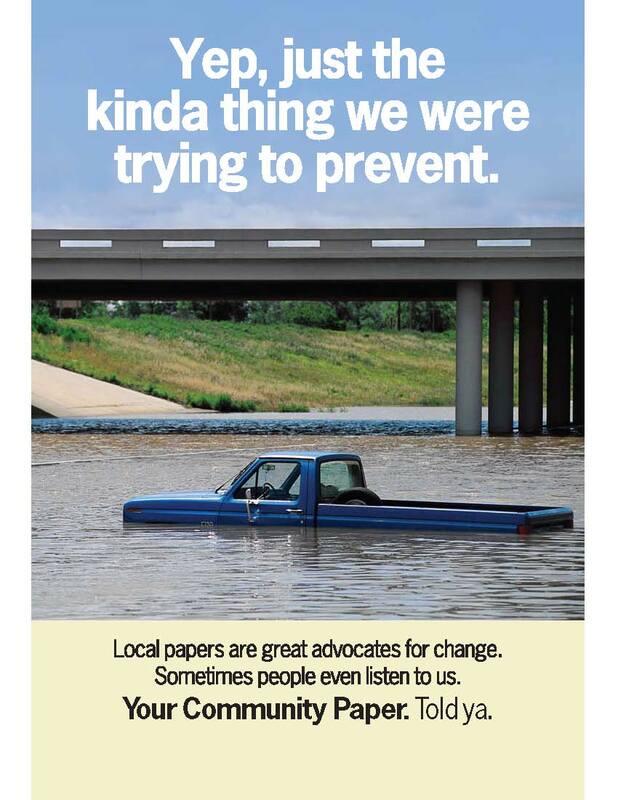 A pickup truck in a lake is as pure a New York City as can be conjured, and its newspapers are great “advocates for change” — change, like building new bridges (over troubled waters) and more highways. (I am joking!) As for those broken sidewalks, most city weeklies gave up that kind of advocacy years ago (although a few — the Brooklyn Star with its filthy lot of the week photo — comes to mind). These last two have possibilities. Some New York City weeklies actually respect military service and still use those Army press releases as filler; others would never use them. 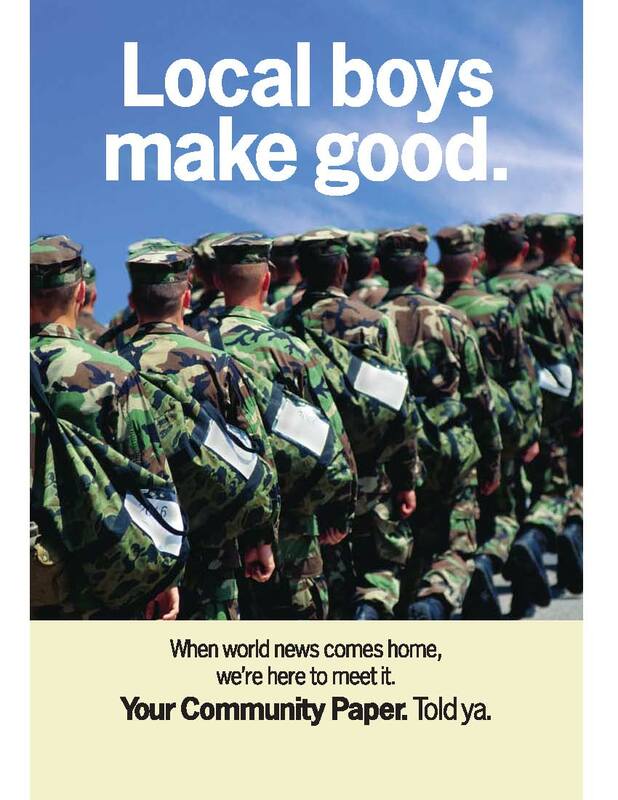 Beyond that, coverage of “boys making good” in the military or elsewhere is rare in the New York City press. The one ad that clicks — meaning it’s “feel good” and harmless — is the last one, “Community news. Un-decaffeinated.” Using a quiticential quintessential New York City image — the Greek diner coffee cup — is a nice touch. This entry was posted in Advertising, New York, Newspapers, Promotion and tagged Andy Griffith, Brooklyn Star, coffee cup, Korey Kay & Partners, New York City, New York Press Association, NYPA, Opie. Bookmark the permalink. You’re correct, Ed, these ads won’t play too well in Brooklyn. But they’ll make sense in other important pockets across America. I was in rural New Mexico this past weekend. No wi-fi but the community newspaper appears to be thriving. It’s worse when we cover development issues. It seems that the public only gets outraged after a building that we’ve been covering for six years if finished. Anything the NYPA wants to do to help is welcome, though I agree with Coney Media that another urban ad would help. The Greek coffee cup ad makes no sense (un-decaffeinated? What does that mean?). Gersh is right, of course. 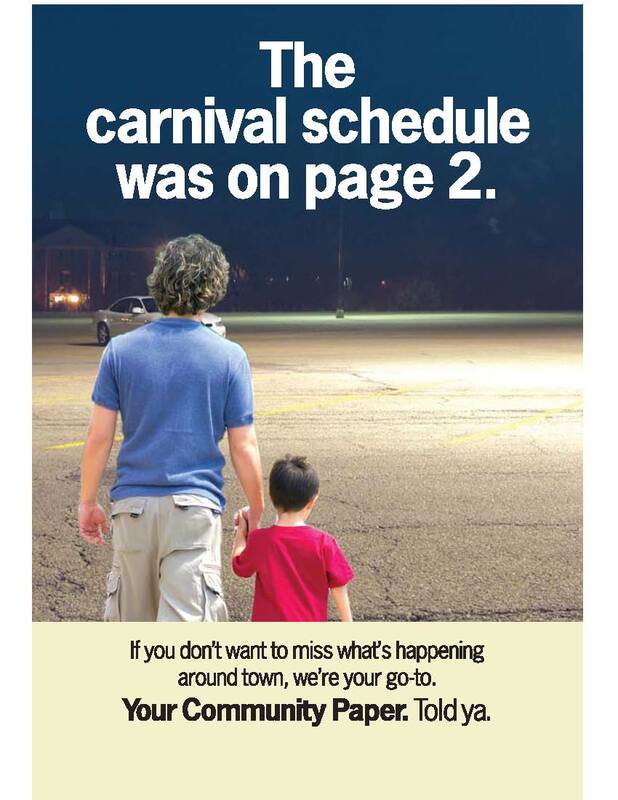 The “message” in the carnival ad rings true — newspapers cover SO many events, so much news, only to have people in the community complain that they didn’t know about what the newspaper went out of its way to cover. Unfortunately, the un-urban image throws this ad away for a city market. 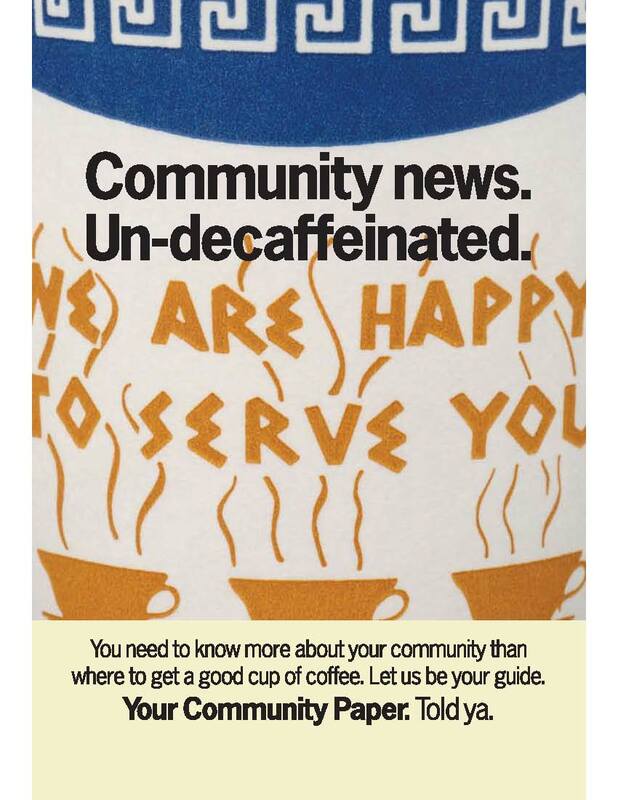 The coffee cup ad may be awkward (“un-decaffeinated” should be simply “caffeinated”), but at least it’s a city image. JerseyEric: The coffee cup is the least attractive of the six ads, but arguably one of only two with an urban image. I hear what you’re saying Ed but don’t necessarily agree. The ads are interesting. Yes, not completely targeted to the City but you can find one of the 6 that might work in every corner of this great state. It’s a nice start. Perhaps it may get more attention then this blog and therefore it appears threatening. Go with it. See what happens. The made-up numbers you reference on the NYPA Web site are from the National Newspaper Association’s study of newspaper readership, which was conducted by the Donald Reynolds Journalism Institute at the University of Missouri. Siena Research Institute will be going into the field later this month to measure readership of New York’s newspapers and their affiliated Web sites. “The carnival schedule was on page 2”. Bah. The reason these papers are in rough shape is exactly because people are getting their information elsewhere. They did not miss the carnival and, in reality, the carnival is no longer paying to publish its schedule in the paper. These are so awful on so many levels. It’s not just the anachronistic approach, it’s also the subtextual anger. They are seethingly hostile with that defiant “told ya” tag line. Apparently $4 million dollars gets you a bizarrely alienating and negative ad campaign. Tip to the marketers: Being pissed at your target audience, throwing a weirdly bitter “told ya” at them and purposefully stirring up bad feelings isn’t the best way to sell something. The strange decision to routinely have the subjects backs turned to the camera leaves one with a desolate overall aesthetic feel. Finally, the “consequences” approach is deeply off-putting, because readers are just not that stupid. The overall theme here is that if you don’t support your community paper, you’ll end up with a broken ankle, a child who misses the carnival, a speeding ticket and your truck will end up washed away in a flood. By the way, your patriotism is also questionable if you fail to pick up the local newspaper. Laughable. And did no one inform the poor New York State Press Association that many municipalities now provide easily downloadable Google calendars of community events that automatically show up in your smart phone? No page 2 is necessary. In fact, it’s laughably archaic. I understand more and more — especially with examples like these — why some experts say that newspaper owners have badly misunderstood the business they’re in. They’re not in the newspaper business (though they think they are); they’re in the content and information business. If they had understood that a long time ago, they would have changed their business model and stopped trying to sell an outdated product with poor ad campaigns such as this one. ROTFLMAO. You’ve got it exactly backward. It’s the elitist snobbery exhibited here that is killing the mainstream media. Most of America is sick to death of it. Thanks, Chas S. Clifton. We also spell it that way here on the right coast. Head corrected. Heh. I *wish* my Gannett fishwrap covered things like broken sidewalks, speed limit changes, and advocating change. All we get is wire service crap from, well, New York and D.C. 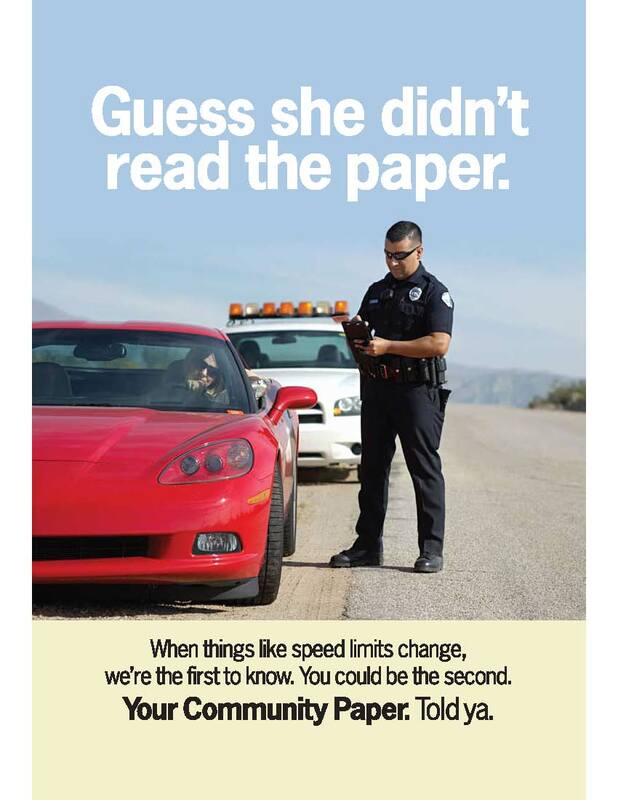 These ads make the local newspapers come off as smarmy d*cks, along the lines of Nelson laughing, “Ha-hah!”. You are correct, the last two have the most potential to “click” with people, with the last being the only example that didn’t annoy me (although the greek coffee cup imagery doesn’t make any sense for any area that I can think of). Seriously, who are the douchebags that came up with the nasty “Told ya” tagline and thought it was a winner? NOBODY likes “told ya” jackasses. 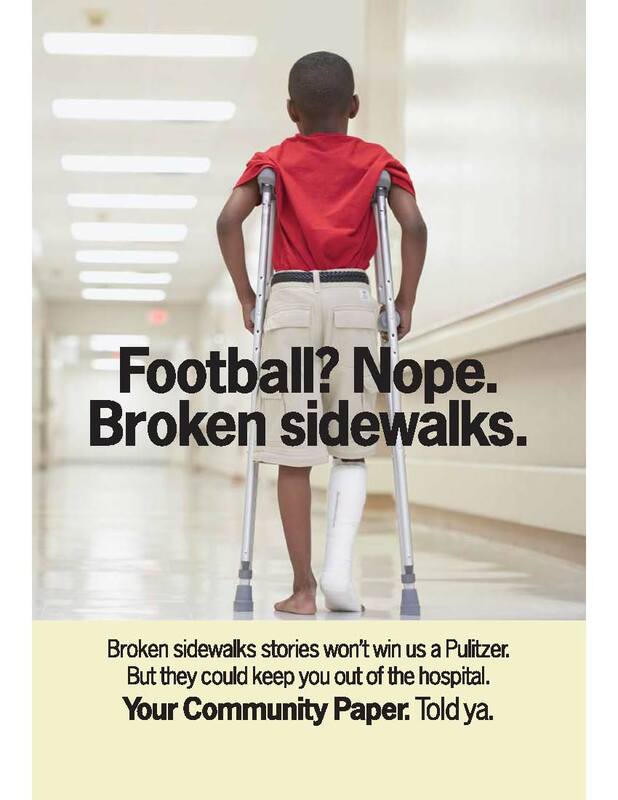 These ads only seem to be clicking with people that are part of the newspaper organization (like editors, etc. ), not whom they should be targeting, like potential customers. Major Fail. You are wrong. These ads are great. The best ever. done a excellent job with this. Additionally, the blog loads very fast for me on Opera. I’ve read this post and if I could I wish to suggest you few interesting things or suggestions. Perhaps you can write next articles referring to this article. I wish to read even more things about it! or go for a paid option? There are so many choices out there that I’m totally overwhelmed .. Any suggestions? Many thanks! in an even 70, although neither man will have much to complain about. The car has nice, deep windows and the cabin is well lit. I don’t write many remarks, however after reading a few of the responses here Hey, Opie — in New York, the newspapers think it’s the 1950s. some of the responses appear like they are coming from brain dead people? For the past several I was searching Bing for sites with any sort of articles on wp theme builder and ended up on . You might be surprised to learn that this is the most helpful web page I have saw that had any useful info on the topic. I just wanted to say thank you this was totally what I wanted.